As the hairpin bend unwinds, you start squeezing the throttle, and the engine note rises from a creamy bass growl to a screaming contralto howl, underlaid by an increasingly fussy backbeat of cams and valve gear. 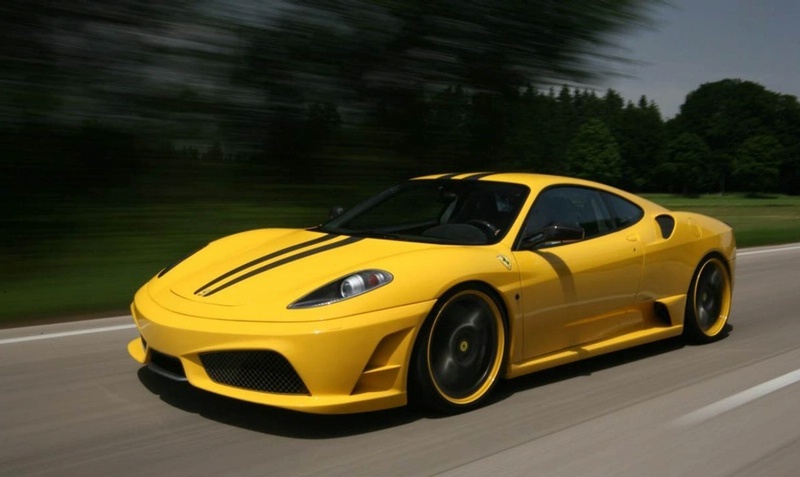 Where the Ferrari 360 Modena sounded like an overgrown motorcycle, the F430 sings a more melodious, more complex tune. It's a delicious, utterly intoxicating engine noise, one that encourages you to use every last one of the 8500 revs that are on tap before you finger-flick the paddle shifter back and engage third gear, just like that. The engine blares, and-bang, bang-you upshift into fourth, then briefly into fifth, before getting on the brakes for the approaching right-hander. On roads like these, you don't miss the manual transmission at all, reveling instead in the way you can drive the car with both feet and delighting in the instant shifts in Race mode. The deep seam of forward thrust, courtesy of a 4.3-liter V-8 with 483 hp and 343 lb-ft of torque, is pretty compelling, too. You think to yourself, This thing is bloody quick, then nail the left pedal before easing off the brakes to balance the car as you turn in toward the apex. The optional carbon-ceramic brakes have bite and feel and tremendous power, yet their response is so well tuned that left-foot braking seems natural. Hit the left-hand paddle on the steering column twice to go back into third, drive the car through the corner, then floor it again. In contrast to its high-strung predecessor, there are fat gobs of torque available as low as 3500 rpm, so you don't need to use those shift paddles as much. The F430 rides the bumpy blacktop on the sinuous mountain roads near Ferrari's Maranello headquarters amazingly well for a sports car that has nineteen-inch wheels and rubber-band tires. It's super-stable at all speeds, its only flaw a lack of wheel travel over the sharpest bumps, which occasionally cause the nose to pitch and scrape the underchin spoiler on the deck. Coming up to another series of hairpin bends, the F430 turns in as eagerly as a kid choosing candy. The steering is so intuitive and so beautifully weighted that placing the car is a cinch, and the chassis is so fluent and poised that it's easy to dial out incipient understeer with power. Once you've switched the traction and stability control off via the steering-wheel-mounted selector, you can even unglue the tail on the exits of these 180-degree bends. The F430 corners flat and true, the fat Bridgestones gripping hard. This is sensory overload, and it's great.